An adult American toad, Anaxyrus americanus, from Butler County, Iowa. No status assigned in Iowa. The subspecies found in Iowa is the eastern American toad, Anaxyrus americanus americanus. The American toad is found statewide in Iowa. 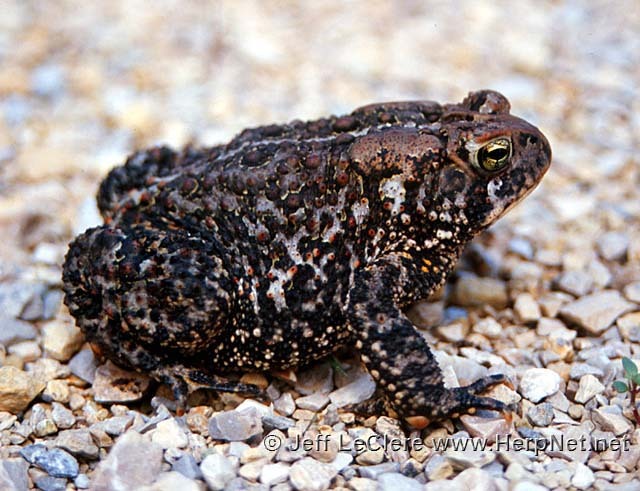 It is somewhat less abundant in western Iowa where it competes with two other toad species. This toad is found everywhere in the state in every habitat. They are found in cities and towns, in parks and backyards. They only require semi permanent water for reproduction. Some wandering non-reproductive adults may be found in areas far from water. These toads are diurnal for only a short period during spring and fall, but are mostly active at night in hot, humid weather. They may be seen catching insects under street or porch lights. I have, however, found them active (rarely) on hot days. To escape hot dry periods, they often burrow beneath the ground. Conversely, during rainy weather, they are very active above ground, especially at night when numbers of toads may be seen on the roads. Underside of an adult American toad, Anaxyrus americanus, from Butler County, Iowa. They breed in the spring right around April and May. The males produce a high pitched trill that may last 30 seconds. The sound is similar to a whistle blown while underwater. At the breeding ponds, males may attempt to breed with anything that comes near them, including other male toads, or other species of frogs. 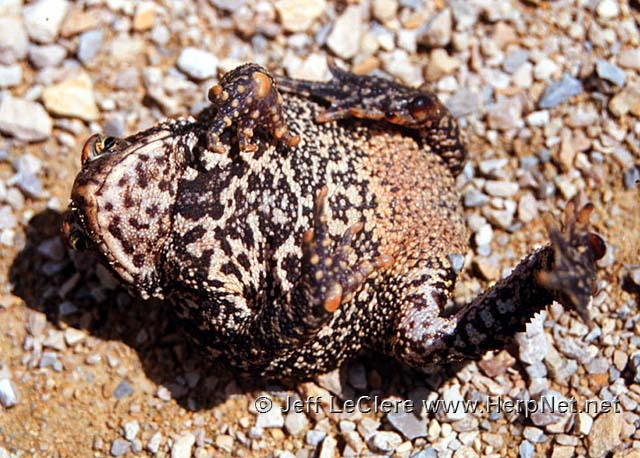 Male toads and frogs make a release call when they are mounted by other anurans. The female releases 20,000 eggs in a string that are fertilized externally by the male as they emerge. These hatch into little black tadpoles with gold speckles. They morph into toadlets in July when hundreds of little, tiny toads may be seen hopping around the shore. An adult American toad, Anaxyrus americanus, from Ringgold County, Iowa. Newly metamorphosed toadlets are dark brown or black, sometimes with little red spots. Adults and young burrow into the ground to avoid freezing temperatures in the winter. 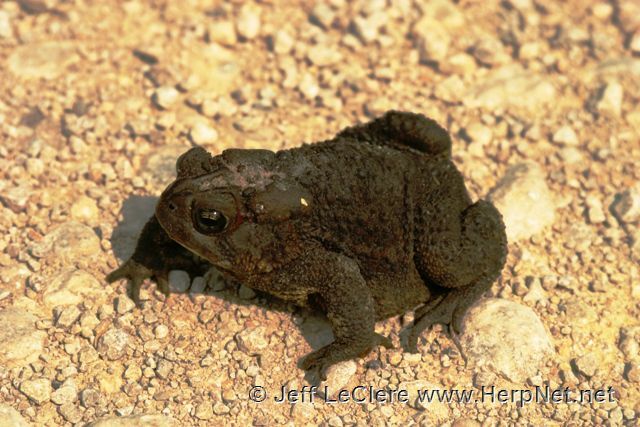 Toads have many defenses against depredation, but causing warts is not one of them! Toads do not cause warts. But they do produce a toxin in the parotoid glands behind the eyes, It is only harmful if it is ingested or rubbed into the eyes. This toxin can make animals very sick. Some animals, such as garter snakes (Thamnophis sp. ), are not harmed by this poison, so instead the toad puffs itself up with air to look bigger and to prevent the snake from swallowing it. 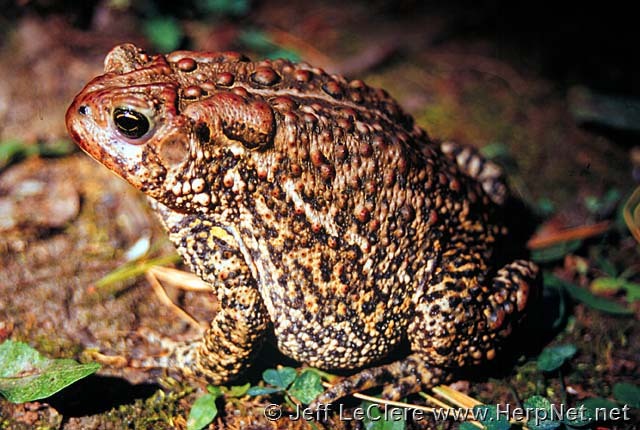 It also urinates, but this really doesn’t do any harm, it just makes the toad potentially unappetizing to the predator. Toads eat anything small that they can fit into their mouths, which are mostly insects and various other invertebrates. Toads actually snap smaller food up with their tongues instead of pouncing on their prey with their mouths open like many types of frogs do. Toads may use their hands and forearms to push large food items into their mouths. They are very valuable as controllers of insect pests. An adult American toad, Anaxyrus americanus, from Polk County, Iowa.